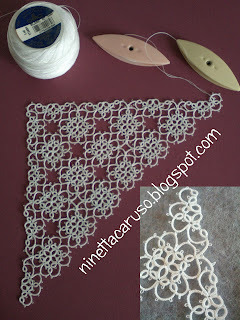 The other day, a dear friend wrote to ask help in tatting a little corner with squared motifs tiled in a beautiful tablecloth, that she found in an issue of "Il lavoro chiacchierino" (issue 16) by Mani di Fata. 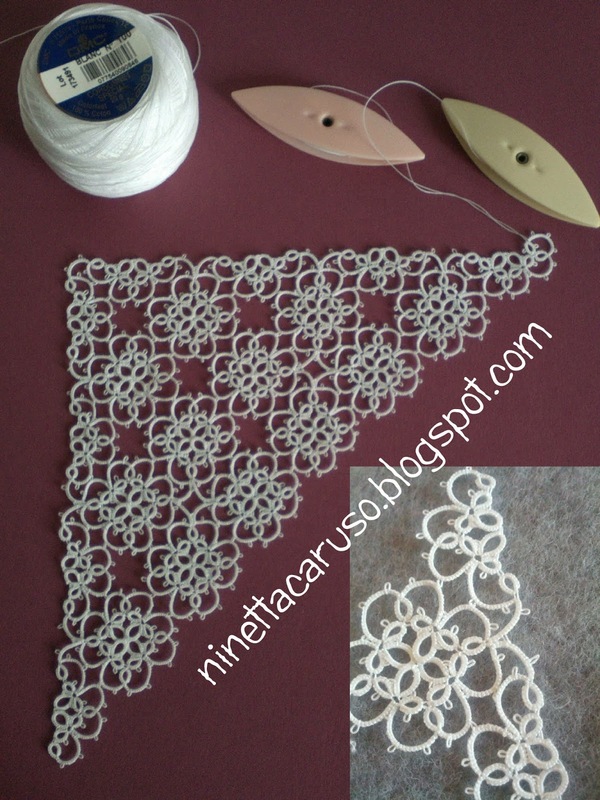 That reminded me of something I had already seen, and in fact it is very similar - but with different stitches' count - to another old pattern, from 1917. 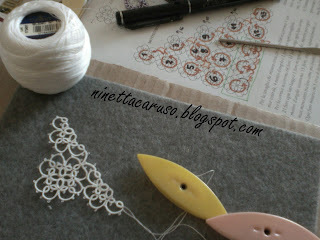 Anyway, her question was about how tatting it with less ends to cut, tie and hide, you know that, the same old story. So I suggested many different "magic square" patterns, also the beautiful onion rings' mat by Robin Perfetti (http://tattingbythebay.blogspot.com/2017/06/onion-ring-magic-square-pattern.html). But nothing. She wanted to tat exactly that one from the magazine. So that's how that has started, I added a chain of 4-8-4 and magically the square became a magic square! That's the power of a chain! Thread is DMC white BLANC, size 100. Well, now I should go on with it, it's a pity leaving it unfinished! Thank you for the challenge, Oriana! Tags are a great way to find similar posts in the blog. If you look at the bottom of every page in my blog, you should find the word "Labels", that is the list of tags I used (in brackets there is a count of the number of posts for each tag). However, on mobiles (and I use it, too) the footer and the sidebars are not visible. That's the reason why I've added another page "(((Blog map)))", it is in the menu in the header bar, with all labels linked. If the number of posts with a certain label exceed the maximum number of post per page, you can read the rest of them as usual, by clicking the button "older posts". I beg your pardon if you find any inconsistency, and please let me know, with a comment. Thank you very much in advance, to everyone of you. About chains' power, I've added a drawing in Flickr, that is just a summary in one page to show how to close a mock ring, aka SCMR. I should say thank you to another friend (Muskaan) who, in a e-mail exchange, mentioned something about the different ways to make the SCMR, and that helped me to remember a drawing that I did in 2013, but never posted. Thank you, Muskaan! Gary and Randy Houtz named and popularized the SCMR. That’s a wonderful magic square. Good when others challenge us. 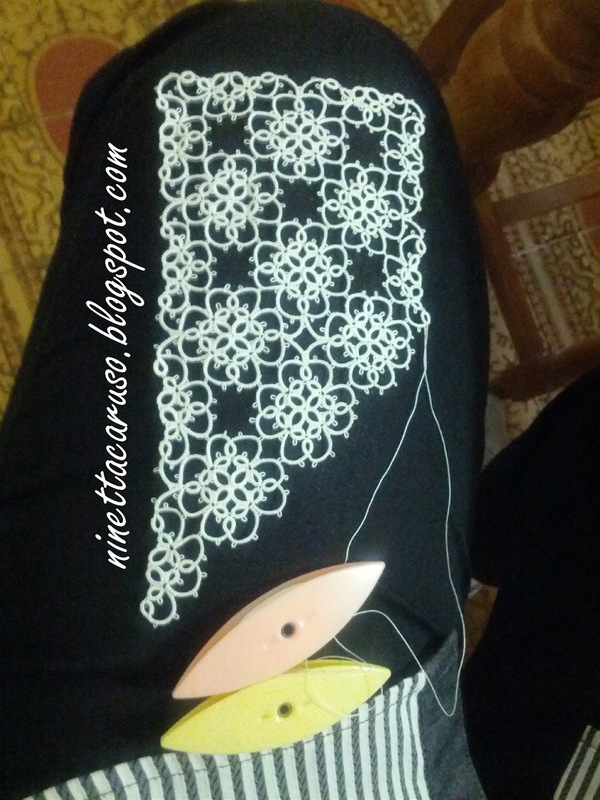 I greatly enjoyed tatting Robin’s magic square. I’m tempted to try this, but I have a lot on the go at the moment, I had better stick to what I’m doing. Ty dear Carollyn and sorry for any issues you'd have with my pictures in Flickr, I'm trying to understand what's happening. That is an awesome design!!! :) Some day I will learn the magic squares and have to try it!! I love seeing the idea of the magic square spreading and new patterns becoming available! Your addition of a simple chain is very effective at keeping the original design intact. Excellent trickery ;-P And you don't even need an edging - it seems to be in-built. Ah, yet another power of the chain - I just posted another use of the SCMR to add new thread.